8 X 10 Double photo frame – Winnipeg Jets. On October 9, 2011, the Winnipeg Jets returned to Winnipeg, Manitoba after leaving 15 years prior. They faced the Montreal Canadiens at the MTS Centre in Winnipeg and played in front of a thunderous and electric crowd. 15, 004 watched the NHL return to Winnipeg and the game ended with Montreal winning 5-1. Top photo shows the Inaugural game faceoff vs Montreal. The bottom photo shows Nik Antropov scoring the Winnipeg Jets FIRST goal against Carey Price. Plate read: “First Game / First Goal – Winnipeg Jets vs Montreal Canadiens – MTS Centre – October 9, 2011”. Authentic Winnipeg Jets Team pins attached. Please contact for pricing. 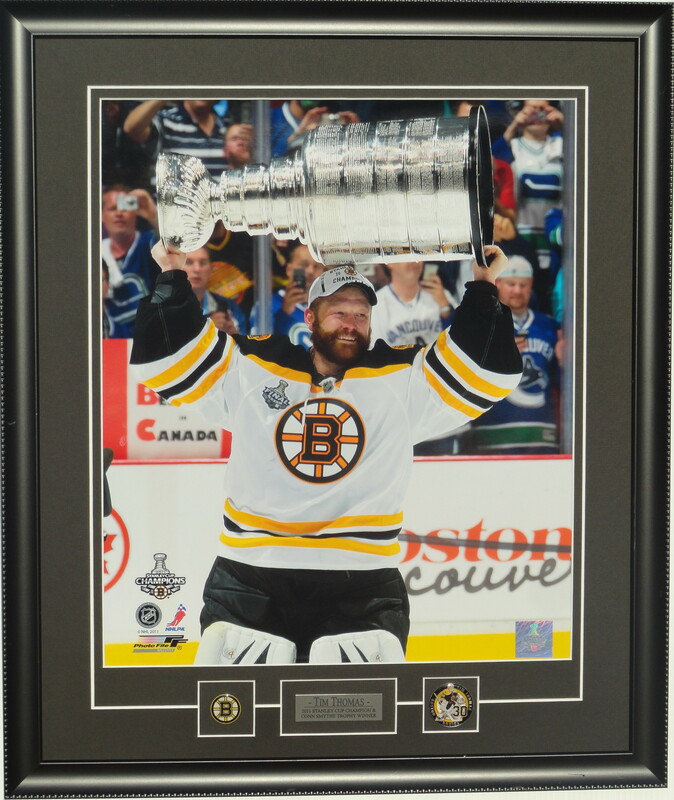 16 X 20 Photo Frame – Tim Thomas – Boston Bruins. As goalie of the Boston Bruins, Tim Thomas guided the team against the Vancouver Canucks to a Stanley Cup in 2011, the team’s first since 1972. Tim Thomas was awarded the Conn Smythe Trophy as MVP of the 2011 Stanley Cup Playoffs. He was also awarded the 2011 Vezina Trophy for being the NHL’s top goaltender. Plate reads: “Tim Thomas – 2011 Stanley Cup Champion & Conn Smythe Trophy Winner”. Authentic Boston Bruins team pin and NEW authentic NHLPA “Tim Thomas” Getty Images pin attached. Please contact for pricing. 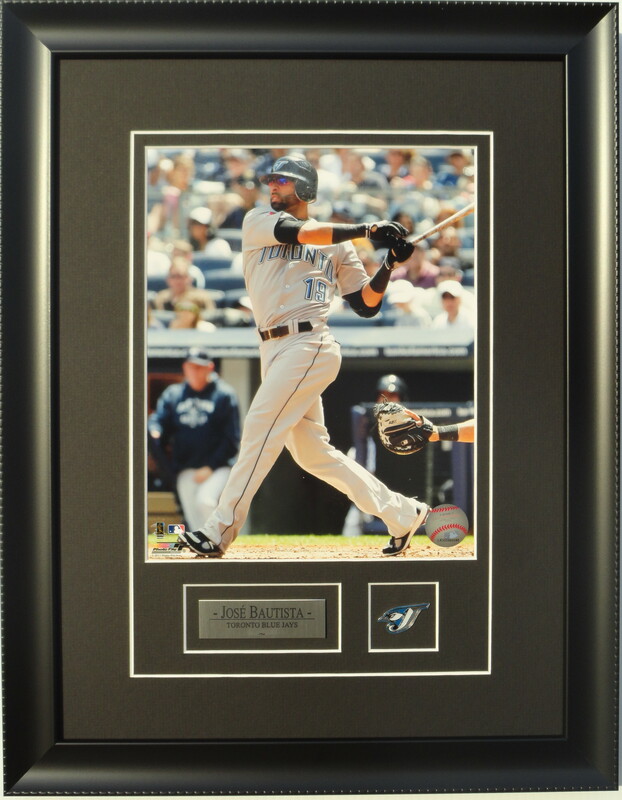 8 X 10 Photo frame of Jose Bautista – Toronto Blue Jays. In 2011, Jose Bautista led Major League Baseball in home runs with 43, and repeated as Home Run Champion after hitting 54 HR’s in 2010. He was named the American League winner of the Hank Aaron Award for the second consecutive season. He also broke the MLB record for the 2011 All-Star Game by receiving 7,454,753 votes. Plate reads: “Jose Bautista – Toronto Blue Jays”. Authentic Blue Jays Pin attached. Please contact for pricing.